There are no simple definitions of systems and systems thinking (Monat & Gannon 2015) that are sufficiently rich to clarify what they are essentially about. So instead, I will offer a circumscriptive definition in three parts and add a small concept map to go with it. Systems thinking …. is the selection and application of more or less general systems methods or systemic problem solving tools to examine, debate, model, and modify systems structures, which underlie systems behavior. 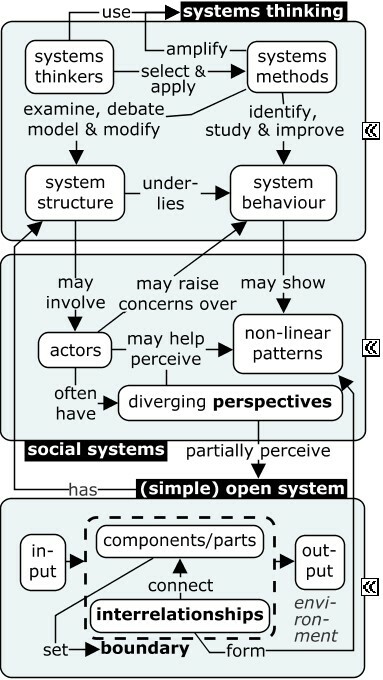 Systems thinking serves to identify and improve or understand the system behavior of a broad range of open systems.